Haven't posted here in a while other than to sell stuff, but this find was worth sharing, and I have some Qs. Walked into Sam Ash for kicks and Giggles and sitting there on the floor was a stop sign badge Gretcsch in 20/12/14, Not gonna say how much, but leave it at "substantially less than a Catalina Club in the same sizes would cost new"
It had Pearl Tom mounting hardware added (a typical 80s move! ), a Ludwig cymbal mount added in an odd place (I assume for a Buddy Rich style splash cymbal) and the wrap (which I assumed was a re-wrap) had gone BADLY cloudy (no scratches or dings or lifting - just pale grey cloudiness all over). As it turns out "simulated rosewood" was an available wrap in the 77 catalog so it's probably original. They are in AMAZING shape other than that issue and the after market mount (which to be fair, ugly as they are, work GREAT). Paper tags are intact (as are the mufflers, though the felt strip from the Pratt is gone) and interiors are impeccable. Consecutive serials on bass and 12" and 16" is close. Any thoughts on possibilities of removing the cloudiness with eg a headlight restoration kit? You bought them cheap, so why not just fill the extra holes and re-wrap in something that you really like? I'm a sucker for most any glass glitter. I'd rip off that wrap and go natural or stain to match that wrap - a nice medium color. I am refinishing a SSB kit right now 12/13/16/22 in Charlie Watts amber lacquer....can't wait to finish so I can play them! I'd try slow-buffing that wrap in hopes that it may remove the clouded, foggy look. Failing that, I'd do as the others have suggested: either strip and finish, or rewrap. I wouldn't be able to abide by how the wrap looks now. I'd try buffing it out, before making and decisions. Original wrap is always preferable. I've had pretty good luck using Meguiar's Plast-X polish on an automotive random buffer. Here's a before and after. Cool kit! Last time I walked into Sam Ash they had a bunch of used kits in the middle of the showroom and they were massively overpriced. I guess that one that you got slipped thru the cracks. Nice score, enjoy it! I ordered my USA shells in February or March of 1977 and they arrived that August...................I still gig with them regularly. I can attest, my '77 SSB drums are superb............I've purchased and played all types of drums but these are the best. The '77 shells were assembled in Booneville, Arkansas when the Gretsch Company was owned by Baldwin, Inc. Most Gretsch snobs will tell you the Arkansas shells are relative crap but the '77 drums are every bit as good as the Round Badge shells (I have a friend that owns SSB shells from 1979 and they are not as good). You can buy other shells that are just as good, but none better -- so, congratulations on your acquisition. I would hesitate to re-wrap, but if you do................be careful what you choose in a new wrap. Those old Jasper shells are already oversized and you might just choose a wrap that makes them larger. This would be a big problem in that head choices would be very limited. For example -- glass wraps are thicker than conventional sparkle wraps. The question is Will restoring the clear outer layer reveal the remarkable colors under neath or has fade reached thru the clear layer and robbed the colors of..color. Yeah, they sound amazing, the bass drum and the floor tom in particular are absolute monsters and the 12 has "that" sound. Blakey etc. I did a test patch on the bottom and the color came back - in places. I think I am going to leave them as is for now, and maybe as my band (finally) starts trying to put some gigs on the calendar start a piggy bank toward a professional re-wrap in either black sparkle or merlot sparkle. 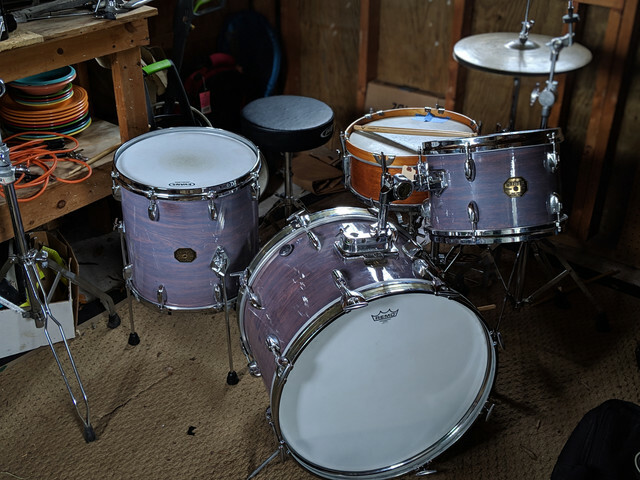 I've stripped and stained+ refinished drums myself before (see attachment, which started life as a mid 60s BDP Slingerland) but the wrap on these is in great shape other than the cloudiness, and is still VERY well adhered, so I'd definitely want pros to do it. I first saw the pics and thought that they were the rare "blue spruce" stained finish! What a sweet find, congratulations on the nice score! SSB era Gretsch suffer from a poor reputation overall apparently based on just a relatively short period of time right after the move to Arkansas when there were some quality control issues due to having an entire plant nearly fully staffed with new workers. Almost none of the Brooklyn Gretsch workers chose to make the move (talk about potential culture shock) so they had a lot of folks "learning on the Job" for awhile. Eventually everyone knew what they were doing and the issues subsided to the same sort of QC level that any of the other manufacturers achieved. They still sourced their shells from Jasper Wood Products so they didn't change at all. I have a few SSB drums and I can't see or hear any particular difference between them and my Round Badged drums. I guess that's a good thing if you want to buy a Gretsch set as these represent a less expensive alternative to the RB drums, yet are more or less functionally equivalent. Even the surviving "problem" drums from the transitional era have likely had their issues sorted out by now. Looks like a cool deal on the set the OP picked up. Generally when you think Gretsch Rosewood it's a reddish stained finish with the grain of the maple showing through but this does look to be a wrap and I vaguely recall seeing another set like that once upon a time. I think it even exhibited the same sort of fading. The metal bass drum hoops would be factory correct for the early to mid 1970's. I bet they were ordered with no mounting hardware then the store or original owner opted for the Pearl mounts, pretty common since Gretsch factory hardware of the time wasn't the most ideal. Actually if you had the Gretsch factory mounts there'd be an even BIGGER hole in the side of the tom for the bracket. SSB era Gretsch suffer from a poor reputation overall apparently based on just a relatively short period of time right after the move to Arkansas when there were some quality control issues due to having an entire plant nearly fully staffed with new workers. Almost none of the Brooklyn Gretsch workers chose to make the move (talk about potential culture shock) so they had a lot of folks "learning on the Job" for awhile. Eventually everyone knew what they were doing and the issues subsided to the same sort of QC level that any of the other manufacturers achieved. They still sourced their shells from Jasper Wood Products so they didn't change at all. I have a few SSB drums and I can't see or hear any particular difference between them and my Round Badged drums. I guess that's a good thing if you want to buy a Gretsch set as these represent a less expensive alternative to the RB drums, yet are more or less functionally equivalent. I think you made my point better than I did.................well said. I had thoughts about 10 years ago to refinish my USA shells -- the plant manager at the Gretsch SC assembly facility (Paul Cooper) told me to call the experts at Fork's Drum Closet...............they persuaded me not to jack with it because it will devalue the kit. Don't hesitate to call those guys before you make a move/decision..................they are very helpful. so you can see the 77 catalog page below that has the "real" wood finishes on it, including rosewood, and then adjacent, but not actually included at the bottom left is "simulated rosewood." I actually am growing to like the pearl mount, because I realized I think I can get an XLR cable down that second mount hole, and put in a kelly shu. This bass drum is an absolute cannon with unported heads, but the average bar/brewery/local event soundguy is not gonna want to handle that much boominess on the resonant side, so an internal with a little extra tape on the batter head should be a nice solution. I've got that catalog and I now see exactly what you are saying. My shells have the wood finish labeled "Ebony"............photo of kit below............13/15/18/24. Maybe a previous owner was left-handed, and that's why the Ludwig cymbal mount is on that side? Anyway, really nice score! I've had decent luck with a 4-step headlamp lens cleaner from Turtle Wax on a recent restoration project. I would lean toward trying to save that wrap if possible, just for the history and the fact that it's super cool. Sounds like a great deal for a SSB kit. I haven't seen the suggestion yet, but have you considered trying Novus? That can really bring some wraps back. Like many on this forum, I tend to go straight for Novus 2, but it may be worth experimenting with Novus 1 and 3 in combination with 2 to remove the upper clouded layer and then polish and restore the luster of the wrap. Take 2 seconds to try a little touch of Armor-All on the bottom of the bass drum to see-if- it de-clouds- the clear- and shows-any if they're left- color underneath.